Words cannot begin to describe this lush resort. It is listed as one of the top 400 resorts in the world. Every amenity that you ever wanted is provided at this resort. People from all over the world stay here, as it is known Internationally. Besides the main hotel Las Hadas is composed of many white washed Arabian looking buildings nestled on the sides of a steep hill. 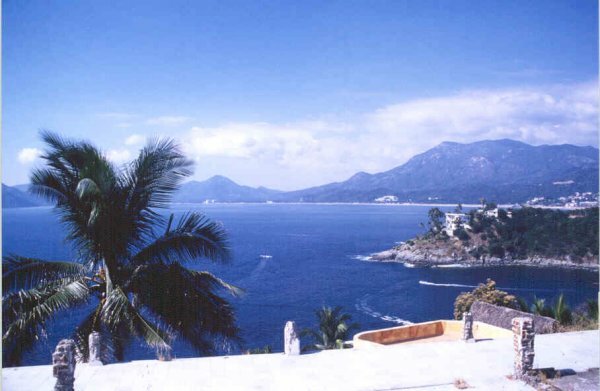 It is situated on a peninsula (Santiago Peninsula) and overlooks on of the bays in Manzanillo. Las Hadas offers an excellent way to enjoy the amenities without actually having to stay at the resort. A set price buys you coupons which you can use on drinks and food and allows you to use any of the amenities for one day. This fee also gives you free covered parking. They have a very large pool in the back of the hotel. This pool is surrounded by many chairs and sunbathers. There is a old looking wooden rope bridge crossing over the middle of the pool. This bridge receives constant use from not only the tourists but also the staff who are always on the move bringing poolside food and drinks to the hotel guests. One of the more noticeable parts of this pool is their swim up bar. They have stools mounted about 1 foot under the water level and a covered canopy overhead. After a refreshing swim you can leisurely swim up to the bar and demand a vodka on rocks from the young bartender. You can sit sipping your alcohol, half immersed in the cool refreshing water, and think of places better then this. You won’t be thinking those thoughts for long. 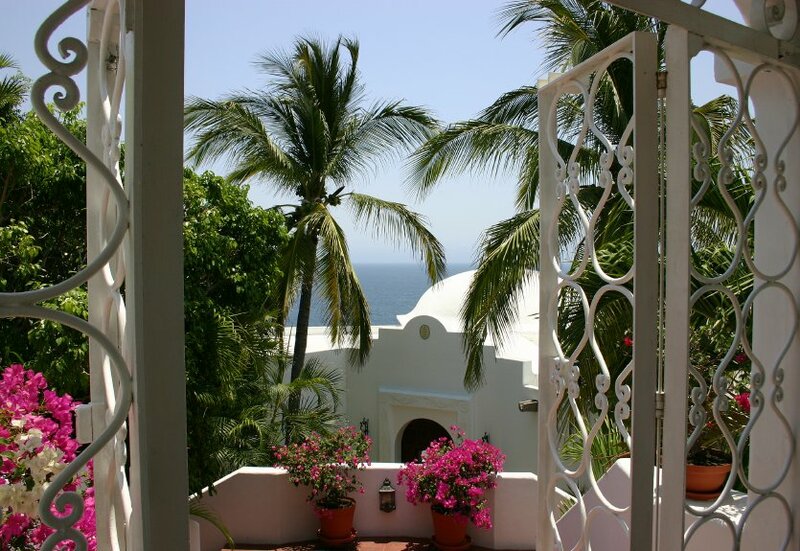 There are seldom places this luxurious and relaxing as Las Hadas. Most topics of conversation around the pool were centered on what the drink specials were on that particular day. Everyone left the pool area when the bar closed. I found this the most relaxing time. The air was still quite warm and the crowds had disappeared and I had the pool entirely to myself. Only a 100 foot walk or so from the pool is the open bay and salt water for more swimming. This water is much warmer then the air conditioned pool, but it is also enjoyable. There are two large platforms that you can swim out to and mingle with all the other young people who are showing off their dives to their girl/boy friends. As you make your way from the pool to the swimming bay you will pass hundreds of people soaking in the rays from the sun. The marina and boat launching facilities are located near the pool and swimming bay. Chances are you will see people fishing from the docks and piers. This is a good place to watch small as well as quite large fish swimming in the waters in the marina. I saw fishermen swimming among the rocks, catching fish with their bare hands, and then tossing them out of the water onto the cement walls. I also saw several fisherman catch some quite large fish. They were straining to even bring these fish out of the water. Then once they were on the deck they had to wrestle with the fish and beat it over the head many times before it died. The marina was a great place to get a sense for the local fishing industry as well as taking fishing action photographs. Las Hadas boasts an exercise room, 18 holes of golf, 10 lighted tennis courts, as well as 3 dining rooms. Las Hadas offers a mini-golf package which entitles you to 3 rounds of golf on a fairly empty golf course. 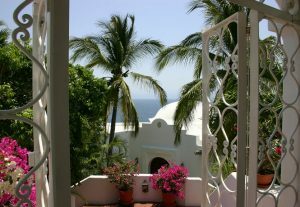 However, recently only guests of the Las Hadas Resort are able to take advantage of this package. If you get a chance I highly recommend the drive out on the northern part of the Santiago Peninsula. The road leads to a high point on the peninsula from which you have spectacular views of the both the northern and southern bays. The photography out here is really incredible. On one side you have Las Hadas and on the other side you have brightly colored umbrellas lining the already palm lined beaches. The water casts a number of shades of blue, there is a warm breeze blowing, and you know that life doesn’t get much better then this.